There wasn't a lot of exciting software at the NAMM music trade show this year and it made me wonder: why are recording software manufacturers being so slow to add Internet collaboration features? Anyone will tell you that we're in an Internet indie music golden age but popular recording tools barely recognize the Internet exists for anything more than patch updates. Cloud services have come to the most mainstream services (email, calendar, music, photos, contacts) but recording software has barely made a move in that direction. There are so many ways the Internet could improve software like Pro Tools, Reaper, Reason, Logic and Ableton Live -- easy collaboration, cloud backups, portability (easily access your audio data on your iPad & iPhone), revision tracking, quick in-software purchasing of samples/plugins/devices, preset sharing and hands-on lessons to name a few off the top of my head. And it makes business sense for the companies. By making the Internet an integrated part of the recording software companies could get their customers into a subscription model instead of this weird yearly upgrade cycle and they’d be free to roll out & market new features any time, distribution and copy protection would be easier, companies could gather metrics on performance to improve the software & stamp out bugs, you could demo and sell features, samples, presets, plugins and lessons to your customers, sell iPad/iPhone/Android apps to work with your cloud data, etc, etc. I feel Ableton Live and Reason are uniquely positioned for success in this area. They’re largely MIDI, sample and loop based so they’d use less bandwidth to sync. Plus their interfaces are already very modular -- selling new devices and features and packs wouldn’t require much redesign. My suspicion right now is that Ableton (who haven’t released a major new version of Live since January 2009) is working on a full rewrite and I’ll be surprised if it doesn’t include a lot more Internet. But whoever it is, someone’s going to make a move and then all the other players will have to play catch up. I wanted to ask your opinion on what you think computers could do to make it easier for musicians to create and perform music. Collaboration: There's a lot of opportunity right now for better creative tools. The biggest feature missing from all the major Digital Audio Workstations is semi-realtime collaboration (realtime is probably asking too much until the net gets better). I was just bugging Justin at Reaper about that the other day. Maybe ohmstudio (http://www.ohmstudio.com/) will fill the collaboration role but I think it's a feature every DAW should have within a few years. 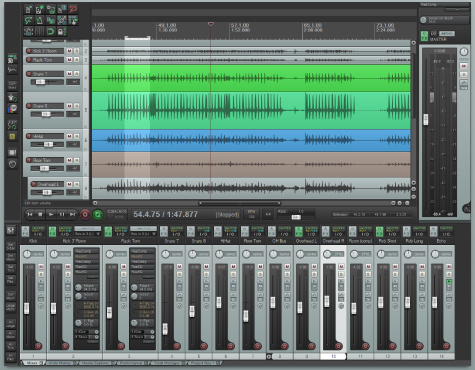 Songwriting: For a long time I've been fantasizing about rapid songwriting software. Something analogous to a lot of the more creative, less technical software for screenwriters. The software could prompt the songwriter for sections, melodies and riffs and keep them cataloged. It'd let you easily rearrange the structure and experiment, organize your notes & ideas and help you generate new ideas. Throw a good rhyming dictionary in there, a markov chain generator for lyrics, etc. So a musician can quickly hammer out a bunch of song ideas and flesh them out without spending much time dicking around in software. I should be able to write and record an entire song with a guitar, microphone and foot pedal to control the software. - ReaEQ - They added a live spectrograph to the EQ, which was a feature other EQs (like the one in logic) made me want. - Selecting chunks of audio in the media explorer is pretty sweet when you have compatible VSTis. You can preview an audio file and select a section from the waveform and drag it right into the plugin or timeline. Very handy. - Midi Track Controls (ReaControlMIDI) - I'm not actually sure if this was in v3 but I know I was trying to get a weird midi controller to control the tracks long ago and had no luck. This makes it easy. - Project Bay - Now you can see and manage all the effects and media you're using in your project. - Screensets - save and recall Reaper window layouts easily. Nice. - The default theme is too dark and the color coding of tracks is really hard to see. I was finding it really tough to organize my projects so that I knew what was going on at a glance. So I switched back to the v3 theme, which is OK for now. - The Media Explorer is slow on my Mac. Hopping between files with the cursor keys is weirdly slow. This was never a thing on Windows. - I'd like a simple multi-sampler. A Battery-style 'pad' sampler would be my preference. Setting up many tracks of ReaSamplOmatic5000 is cumbersome. - Some metadata/search in the Media Explorer would be great. I have a ton of samples kicking around but if they're not easily at hand. - Workflow improvements - Reaper is already so far ahead of the competition in functionality that I think it'd benefit from some time spent on its usability. While it's awesome that each pulldown and context menu and preference page are overstuffed with cool options, it can be overwhelming. And I'm a pretty huge nerd so I assume the less techy out there go into cardiac arrest at the sight of it. Anyway, great job Reaper team. It's fast and small. While the 4.4MB installer file size is great, it's the responsiveness and quick loading time that are truly awesome. Cubase feels bloated and slow after using Reaper, as do most DAWs. Powerful. The amount of features in it are ridiculous. You may have to hunt for the options, but 99% of the time it's there. I haven't had it crash on me yet. It's fully customizable. I feel like I can trick it out as much as I want. From themes to keyboard shortcuts to actions, you can make it your own. Frequent useful updates. Unlike Cubase's usual â€œlaunch buggy, gradually patch those bugs and save any useful new features for the next version you have to pay forâ€ you actually get an amazing amount of updates and improvements. An active community and approachable developers. Reasonable or good ideas get implemented quickly, developers are responsive in the forums, lots of people were helpful when I was flailing around in â€œI'm used to Cubase!â€ land. It plays nice with dual monitors. HOORAY. Quick search of VST plugins. I don't feel locked in. Project files are in plain text, you can export your stuff easily. You can move your preferences around easily. There are so many options that new (and/or less tech-savvy) users will likely feel overwhelmed hunting down the right checkboxes to get the behavior they expect. It's awesome that it's so customizable, but I'd love to see them pick some more universal up-front options and move a lot of the tweaks to a Firefox about:config style interface or just an .ini file. A lot of the comping/audio behavior doesn't make a lot of sense to me. The logic behind which items play and which don't when they overlay each other on the same track still confuses me, so I try and avoid it. Comping generally works but lacks the precision of Cubase or Logic. Anyway, it's been good and I recommend trying it out. There's an un-crippled evaluation version so you've got nothing to lose.